Madeleines are simple sponge cake-like cookies - so simple that you probably have all of the typical madeleine recipe ingredients in your house right now. In a small saucepan or microwave oven, melt butter and let cool to room temperature. In a small mixing bowl, beat eggs, candy caps or extract, and salt until fully combined. Beating constantly, gradually add sugar. Continue beating for five to ten minutes at high speed until mixture is thick and pale and ribbons form in bowl when beaters are lifted. Pour melted butter around edge of batter. Quickly but gently fold butter into batter. 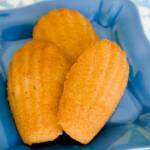 Eat the madeleines on their own, dunked in coffee or hot chocolate, or spread some frosting on them.